Ms. Cupcake » Our Charity of the Month is Lambeth and Southwark Mind! Ms. Cupcake > News > Cupcake News > Our Charity of the Month is Lambeth and Southwark Mind! As you may know, we have partnered with a new charity each month to support all the amazing work they do. This month, we’re supporting the wonderful people at Lambeth and Southwark Mind. They aim to provide innovative, long-term services that empower and support everyone within the area who are experiencing mental health problems. 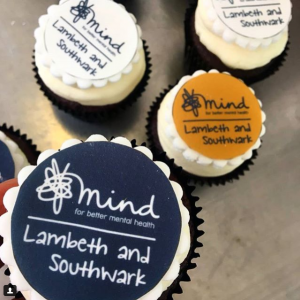 To show our support, we’ll be selling our Chocolate Vanilla Split cupcakes branded with the Lambeth and Southwark Mind logo in store throughout May. £1 from each sale will go directly to the charity. You can find out more about the great work Lambeth and Southwark Mind do here. This entry was posted on Thursday, May 3rd, 2018 at 12:03 pm and is filed under Cupcake News. You can follow any responses to this entry through the RSS 2.0 feed. Both comments and pings are currently closed.